The Long-billed and Short-billed Dowitcher can both be found in Tennessee, especially during fall migration, and the Long-billed is the one less likely to be encountered. These shorebirds are both medium to large-sized with very long bills. The Short-billed's bill is only short in comparison to the Long-billed Dowitcher's bill, and the bill of the female Short-billed is the same length of that of the male Long-billed! Their rapid probing in the mud while foraging is often described as like a "sewing-machine." Both will forage day or night, and readily swim. Range, habitat, and vocalizations should all be used to help distinguish between these two species. The Long-billed Dowitcher breeds in the high Arctic from eastern Siberia across Canada, and winters along both coasts of the United States and inland through Mexico and northern Central America. Description: This medium to large-sized shorebird has a bill that is twice as long as its head, and moderately long, pale legs. In flight, it shows a distinctive white blaze up its back, as does the Short-billed Dowitcher. In spring breeding plumage (April-August) it is reddish below and mottled-brown above; in fall (September-April) it is gray above and pale below. Immature birds (July-November) have a buffy chest and flanks, but are more plain than breeding adults. A key to distinguishing immature Long-billeds from Short-billeds is that the tertials of the Long-billeds are plain grayish with narrow rusty edges, instead of patterned. The female has a longer bill than the male. Voice: Call is a high, sharp keep, sometimes repeated kik-kik-kik-kik. Wilson's Snipe has similar proportions, but a has dark rump and tail, and golden stripes down back. Short-billed Dowitcher is extremely similar and difficult to distinguish in most plumages. Voice is best character to distinguish adults. Juvenile short-billed has tiger-striped tertials instead of plain gray ones. See link below for more information on distinguishing these two species. Habitat: Found in freshwater mud flats, flooded fields, and lakeshores. Diet: Aquatic invertebrates and insects. 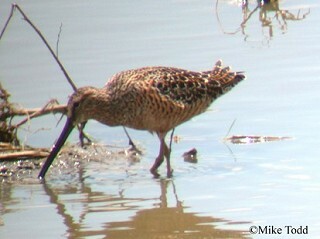 Nesting and reproduction: Neither Long-billed nor Short-billed Dowitchers have ever nested in Tennessee. 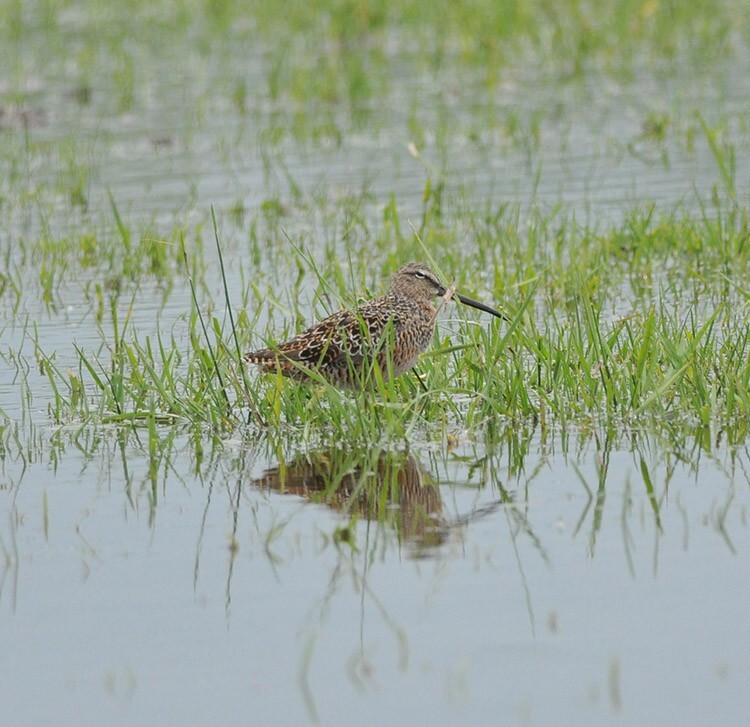 Status in Tennessee: The Long-billed Dowitcher is an irregular, rare migrant across in Tennessee. It is more likely encountered in fall than spring, and expected in the state from late April to mid-May, and from mid-July to early November. Most Siberian breeding Long-billed Dowitchers likely migrate to the Americas during the winter. Dowitchers were known to early American ornithologists like John James Audubon (1785-1851) and Alexander Wilson (1766-1813), as the Red-breasted Snipe, while hunters called it the Brownback. The name Dowitcher may have originated on Long Island among Dutch and German immigrant hunters. Early ornithologist and surgeon Elliott Coues (1842 -1899) wrote that "dowitcher or ‘dowitch' is derived from ‘Deutscher' or ‘Duitsch,' which referred to the ‘German' or ‘Dutch' snipe," to distinguish from what we now know as the Common Snipe of Eurasia. Takekawa, J. Y., and N. Warnock. 2000. Long-billed Dowitcher (Limnodromus scolopaceus). The Birds of North America, No. 493 (A. Poole and F. Gill, eds.). The Academy of Natural Sciences, Philadelphia, PA, and The American Ornithologists' Union, Washington, D.C.